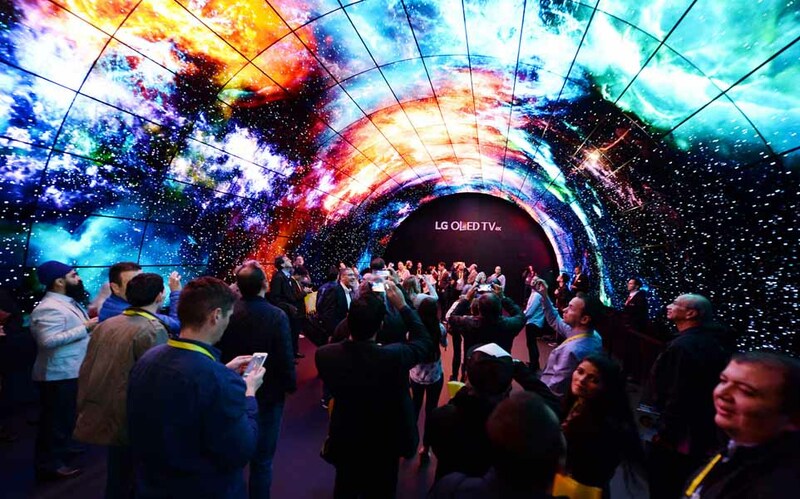 A tunnel of video displays at CES 2017. Just when you think you’ve seen everything in the world of electronic gadgets for the modern “smart home” — remember the Wi-Fi-enabled Crock-Pot of a few years ago, or the soon-to-be-forgotten Mr. Marinator — along comes another Consumer Electronics Show in Las Vegas, and the world of digital possibilities opens wide once more. This year’s International CES, held a few weeks ago, didn’t disappoint. It showed off a dazzling array of digital gadgets you didn’t know you needed, including a camera-equipped drone — Wi-Fi-enabled, of course — that supposedly can fly through your home to investigate unexpected activity while you’re away. The tech reporters at CNET, meanwhile, chose to analyze the pros and cons of robots that made and served steaming-hot cups of coffee and tea. ‘WHAT TO KNOW ABOUT CES 2017’: This report from The New York Times outlines the major themes and technologies at the recent show, including emerging 4K television sets, smart home systems, and advances in consumer-grade drones. SMART MIRRORS, ROBOTS AND MORE: Realtor Magazine profiled four new technologies for the home that attracted attention at CES: smart mirrors, robots in the home, voice-activated devices, and new ideas in refrigerators. NEST LABS: One of the top innovators in the field of smart home technology, Nest Labs makes thermostats, security cameras, smoke and carbon-monoxide alarms, and smart home system controllers. Yesterday, Pacific Union announced an exclusive partnership with Nest Labs that will enable our real estate professionals to equip their clients with the company’s smart home systems. A SLIDESHOW OF NEW GADGETS: Take a few minutes to look at CNET’s slideshow of smart home devices at CES 2017, including digital TV antennas; a kitchen scale that recognizes produce and meat and provides calorie counts; advances in robotic vacuum cleaners; Wi-Fi-controlled light switches; digital cameras; voice-activated home thermostats; wireless locks; a Wi-Fi-controlled oven; home robots; and a smart shower head, a smart pet feeder, and a smart hairbrush. MORE ON SMART HOME TECHNOLOGIES: A recent report on the Pacific Union blog explored several topics related to smart home devices. Builders are increasingly including the technology in new homes, and young homebuyers say it’s a major factor in their decisions. Also, sone insurance carriers offer discounts to owners who wire their home with smart amenities.